Isle of Wight Caravan - Holiday Caravan for Rent on the Isle of Wight. 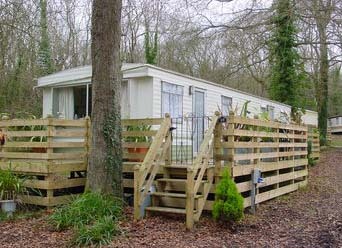 Woodside Bay is a tranquil, woodland static caravan park situated near Ryde on the beautiful Isle of Wight. The site has its own beach on the Solent and offers great views of the ocean liners from Southampton. Our modern van is fully equipped for self catering and has 3 bedrooms sleeping up to 6 people - an additional 2 people could be accommodated to sleep in the lounge. Changeover days are Saturday and weekly costs range from £150 to £500 depending on the time of year. The price includes all water, gas and electricity - there are no hidden extras. Well behaved dogs are welcome as long as they do not chase the resident red squirrels! Site is only 10 minutes drive from shops, pub, restaurants and takeaways. You can view a detailed street map of Isle of Wight here - Isle of Wight Map, get the latest weather here: Isle of Wight Weather, and more information about Isle of Wight here: Isle of Wight Guide.